Invisalign® is a clear alternative to braces. 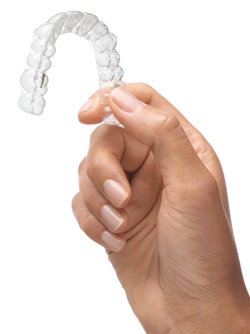 Invisalign® uses a series of clear mouth appliances that are custom-molded to fit you. The virtually invisible aligners gradually reposition your teeth into a smile you'll be proud of. The invisalign® technique is the clinically proven, nearly invisible way to straighten your teeth and improve your smile – without braces. The invisalign® treatment works trough a series of removable and nearly invisible aligners. Each aligner is slightly different, moving your teeth gradually into the desired position. No metal wires or bands to irritate your mouth, and best of all, most people won't notice you're in treatment. Invisalign®, the clear alternative to braces, has been chosen by over 500,000 people who want beautiful smiles. So if you want to show your smile and not your braces, find out more about Invisalign® by clicking here and contact us for more information.